Alter The Press! : Ed Sheeran Releases New Song "Don't"
Ed Sheeran Releases New Song "Don't"
Ed Sheeran has released a new song titled "Don't," which can be streamed below. 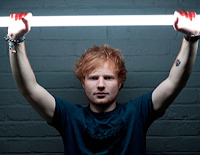 The track taken from Ed's long-awaited new album X, which will be released on June 23rd worldwide via Atlantic Records. Pre-order your copy today via iTunes.